OECD Watch has developed the OECD Watch Case Check, an online tool to help potential complainants decide whether they can use the OECD Guidelines to address a particular situation of corporate misconduct they are experiencing. 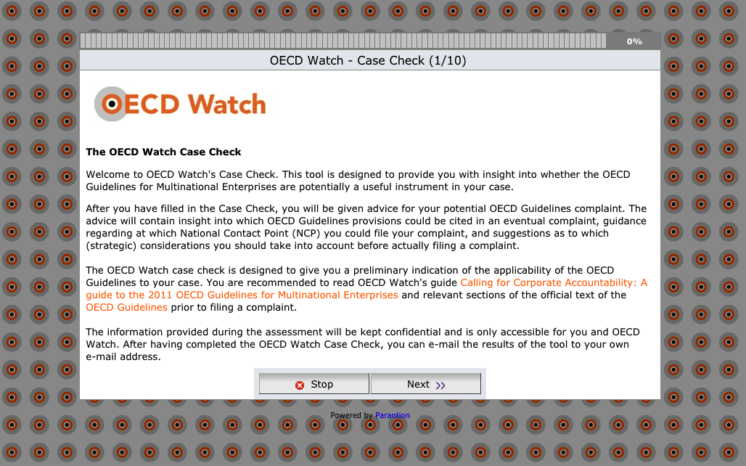 How does the OECD Watch Case Check work? The Case Check guides you through a set of questions about the corporate abuse situation you have in mind. At the end of the questions, the tool will automatically generate a PDF tailored to your case with advice on whether the situation appears covered by the OECD Guidelines, which OECD Guidelines provisions could be cited in an eventual complaint, which National Contact Point (NCP) you could file your complaint to, what type of evidence might be helpful to your case, and other suggestions and strategic considerations you should take into account before actually filing a complaint. Although the Case Check provides the range of OECD Guidelines provisions that could have been breached in your situation, OECD Watch recommends you still read the relevant sections of the official text of the OECD Guidelines prior to drafting the complaint to determine which provisions you should best cite. After completing the Case Check, you can download the PDF or e-mail the results of the case check to your own e-mail address. The answers provided by you in the Case Check will be kept confidential and are only accessible for you and OECD Watch. To return to a previously filled out Case Check, please login below with the credentials you have received by e-mail.